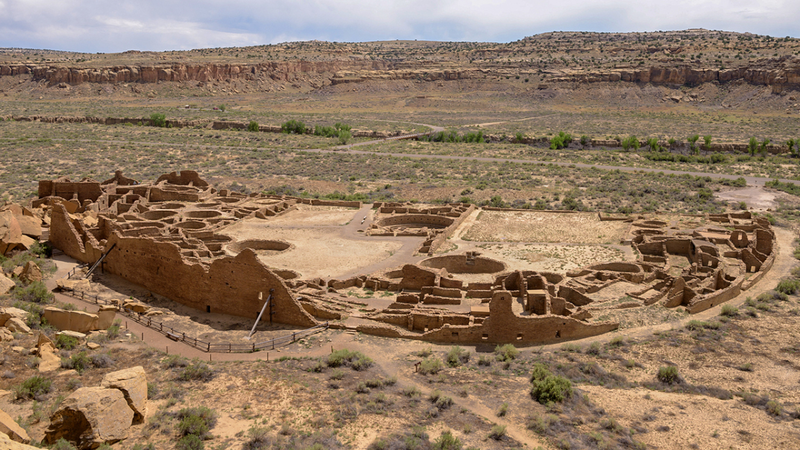 The center of Ancestral Puebloan (Anasazi) culture 1000 years ago, Chaco Canyon in northwest New Mexico is one of the most impressive archaeological sites north of the Rio Grande. The magnificent masonry ruins of this UNESCO World Heritage site encompass six large pueblos containing over 1600 multi-story rooms, more than 90 kivas and numerous Great Kivas. 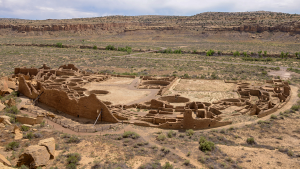 Ancestral Puebloans blended work and worship; they were master artisans, farmers, astronomers, traders and skilled engineers, creating an extensive trade network of pueblos with connecting roads throughout the San Juan Basin and beyond. Our personal guide is geomorphologist Fred Nials whose research focuses on subjects as diverse, and as interrelated, as the Chacoan road system, the influence of streamflow on Hohokam canals and the effects of environmental variation (El Niño in particular) on cultural development in the Southwest. Oh, and in case you were wondering, geomorphology is the study of landforms and how processes such as wind, water and ice can shape the landscape. From an overview of Chacoan culture in the Canyon itself, to an off-road trek to visit Chacoan outliers, our exploration takes us not only to well-known sites such as Pueblo Bonito, but to significant and seldom-visited sites including Pierre’s and Twin Angels; in-depth visits to Salmon Ruins and Aztec Ruins National Monument are also featured. All along the way, Nials describes the science and the theories surrounding the strategies and techniques Chacoan people used to adapt to their often-challenging environment. Hosted by Stephen Bernier and South of the Border Tours, all-inclusive cost covers transportation by motorcoach and passenger van, accommodations at the Best Western Gallup Inn and Suites and the Courtyard by Marriott in Farmington, meals, guide services and admission fees.